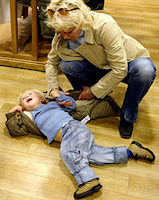 "My son, who is nearly 5 and has Asperger's (high functioning), has started to get uncontrollable meltdowns. He is as nice as pie one minute, and then for what seems like no reason at all, he kicks off, hitting, jumping, throwing things, and laughing almost hysterically. Nothing calms him down when he is like this. Please let me know what can be done to stop this behavior." Parents with children who have Asperger Syndrome and High-Functioning Autism will often tell you about times their child has had a “meltdown” or type of temper tantrum that can disrupt the lives of the whole family. These types of behaviors can be as rare as once a month or can happen several times per day, leaving parents sometimes frustrated and exhausted. There are, however, things a parent can do to minimize the strength and length of these tantrums. The first thing to pay attention to is your own response to the tantrum. Are you calm and quiet? Have you taken steps to assure safety? Are you thinking clearly? Take slow, even breaths and reassure yourself that you’ve survived these meltdowns before, and it doesn’t have to be the dreadful experience you anticipate it to be. Speak with a soft, neutral and pleasant voice. This relaxes both you and your child. Stay away from unnecessary words, and keep your movements slow and purposeful. Many meltdowns happen as a result of rushing around or trying to get somewhere. It’s vital to take the time to slow down and rearrange your priorities. Forget that you have a timetable and concentrate on helping your child settle down first. Keep safety a priority. Children in this stage can be impulsive and can forget every safety rule they were ever taught. If the child is having a meltdown while you’re driving, stop the car and take care of the issue. If your child tends to run away from you, resist the urge to chase them as it can make the situation worse. Hold your child if necessary or talk with him in an attempt to redirect his behavior. In other situations, let the meltdown run itself down. Bear in mind that the child will often be exhausted after a meltdown so that you may need to give him the time to rest and get his breath back after such an event. Remember that these types of behaviors represent ways you child is trying to communicate with you. Think about what the behavior represents and make attempts to avoid the behavior the next time. In addition, think in terms of prevention rather than intervention. Once a meltdown occurs, it's too late to put the brakes on at that point. It's infinitely better to learn your child's "revving up" signals (i.e., the signs that he's becoming agitated or frustrated) and find methods of distraction to get him off that track immediately. As one parents stated: "There usually isn't any stopping it once it gets to that level. You have to try and head it off before it starts. They can't be calmed and told to stop. I've found help by talking to my sons after the meltdown. I tell them they can't act like that, that it isn't good for them or anyone else. I let them know I know things are hard for them but they still have to find another way to cope. And I give them choices. I've made a sensory area that is just for them. We call it the cool down club house. It is a pop up tent with sensory things inside. Fidgets, coloring things, other small toys they enjoy. When they feel one coming on they are to take themselves away from the situation and go to their club. If they allow themselves to get like that, then there is consequences, and I let them know what they are prior. It puts them in charge of their meltdowns and let's them know its not proper. On top of that, it gives them rules = and Aspies like rules. It has helped us anyway." • Anonymous said... HUGS. Just know that you are not the only one! That helps a little. Really, I've found that there are no quick fixes. Eliminating food dyes helped us some, but it was not a miracle cure. My son still has meltdowns at almost 11, but over time he's slowly learning control. It may help to see what is triggering these meltdowns and avoid the trigger, if possible, or approach it differently. When there is anxiety or things appear to be heading toward a meltdown, try using some coping techniques that she can learn ahead of time, like "squeezing lemons" (squeezing her fists together repeatedly) or concentrating on her breathing to calm herself down. It will take a while and you'lll have to work with her on those. See what kinds of things she finds soothing. For my son, it's warmth (especially warm water) and heavy pressure (he likes to be a sandwish between two beanbag chairs). Most kids have something soothing that can head off a melt down as well. Some OT things that can be helpful are a weighted or neoprene vest, squeeze balls or textured toys, and things like swinging or spinning depending upon her preferences. There are lots of these calming OT things available for purchase online. Finally some studies have shown that teaching children to meditate, even for just a few minutes each day, can help their overall temperament. There are some good yoga and meditation websites for kids that you can take a look at, and see if a few months of meditation helps. Finally, unless you have a personal objection to medication, talk to your daughter's doctor about it. She's young, but I have found that there are some medications that help my son stay calmer overall, and have more control when his emotions are spiraling. Meds are not for everyone and I won't recommend any here since all kids are so different, but it's a last-resort that's available if she needs it. • Anonymous said... I agree that it can be the simplest sensory issue and you need to think of the common thread. I am amazed how my son can articulate like when we took tennis lessons in a huge tent that magnified every sound. He told me he was listening to every conversation and sound and couldn't pick out the sounds he was involved in. I'm very lucky my son can verbalize sometimes what is setting him off and understand his noise sensitivity. I say stay open minded to find which sensitivities bother your child. Food coloring is another for us. • Anonymous said... I completely understand what you are experiencing! My daughter is now 12 and continues to have meltdowns that can turn into full blown tantrums that can last an hour! We have been trying for years to understand and prevent them. It is just like a light switch- she is completely fine and chatting and then she is screaming & out of control. It makes no sense- very irrational! Age, maturity, medication and time continues to help but it is a constant struggle. I can only tell you that you are not alone. • Anonymous said... I personally agree with Heather. Although food may be playing a part and is definitely something to look into, I have found with my son that meltdowns usually happen because he is overwhelmed or frustrated over a given situation. I have to constantly remind mysel to make sure he is well prepared for the day (if there are changes to the normal routine, explain early why and what is expected - behavior wise from him as well as what the new or changed event is). Every meltdown my son has had, I can usually tie to me not being as understanding or as patient as I should have been. I'm not trying to say that is what's happening for you, but after many years (my son is now 13), I have found my behavior or expectations usually compound the problem. • Anonymous said... I'll second the food dyes. We had to eliminate red 40 from my daughter's diet. She would go from a very sweet, obedient child to a real handful. Between the Flinstones chewable vitamins, Nestlé strawberry milk, breaded chicken nuggets (yes, it's there, too) she was overloaded. Once we eliminated it from her diet she was a different child! • Anonymous said... Just a quick note, many things help and others don't, that of course, will be child specific. I have a 16 year old and whilst life is always interesting with an aspie, the major meltdowns have subsided as he has matured and been taught what is and isn't socially acceptable. I whole heartedly agree that this is vital for the child to find 'their' place in the world. But the key to getting there is vigilant preemption of triggers. ....it is waaaay easier on all of you to avoid them and as you all know, they usually aren't major issues. The other thing to remember is that you are looking after YOUR child and YOUR family. ....no one else's, their judgment is unimportant! • Anonymous said... Please be careful the meltdowns don't turn into violent melt downs We carry a distraction with us at all times ie Lego that he will play with and it will distract him. We let him melt down a little while and watch from a distance then try and distract him with food or toy. If this doesn't work we leave him alone for another minute then try again. • Anonymous said... sigh. maybe make it clear that what he's doing is not appropriate and that it's not acceptable. it's not the food, it's whatevers setting him off in the first place. take a look at what happens right before he has a meltdown. the "what seems like no reason at all" IS a reason to kids like him with aspergers, and I guarantee he'll feel better just with you sitting down to find out whats upset him. fixing what upset him (if possible and "acceptable") will do a world of wonders. I dont normally rant like this, but as a parent of an aspie and as an aspie myself, it's something I feel very strongly about. if you raise a child to ride the aspie train, they'll do so their whole life. teach an aspie to deal with issues first hand like every other neurotypical child (within reason, of course), you'll raise an amazing aspie. • Anonymous said... Two of my kids are very sensitive to food dyes. Eliminating food dyes from their diets has made a huge difference for us. On days when they don't have food with dyes, they are in control of their emotions. On days when they have food with coloring, they have enormous meltdowns and loss of emotional control. Figuring out this trigger was a lifesaver for us. • Anonymous said... Watch the protein/carbohydrate balance, too. I could definitely see mine burn out faster after a heavy carb meal or snack. Once that blood sugar dipped it was meltdown city! • Anonymous said... When I discovered that my aspergers son was allergic to red dye, it was like a miracle. the days of dr. Jeckyl and mr hyde syndrome went away and although he is still an aspie kid, on the spectrum, there are no more crazy explosive manic uncontrollable over reactions. ... unless we get red dye by mistake, then look out for about 3 days. I am reminded each time it happens, to me or him, how life would be if we'd never discovered the link. • Anonymous said... When you remove the dye, it becomes that much easier to find the other triggers: noise, sleep, frustration, anxiety. Also O.T. made a huge difference for us, getting on a sensory diet st home and before school made the day go by so much better. Riding a bike or scooter in the morning and installing a hammock chair swing were two things that help us still to this day. Movement helps my kids organize their thoughts and feelings. Hope it helps. • Anonymous said... Wish I knew. We try to calmly talk to our nine year old. He was diagnosed last year but school suspected it since kindergarten. Since he was verbal, I didn't see it. He has had some meltdowns that have caused people to threaten to call cops nome because they didn't understand. Now that I know he is aspergers, I can handle the meltdowns a but better and know how to react better. • Anonymous said... Don't misunderstand what I'm saying...I still have a child w/ Aspergers. I still have to talk to her about what is acceptable social behavior. She still has obsessions and adheres to routines. She still suffers from anxiety and has sensory issues. We have our challenges every day. What I said is that there are substances like food dyes going into these kids that can influence their behavior, ability to concentrate, etc. My daughter does so much better when these things are eliminated from her diet.